The Richmond Football Club and AFL community lost a legend this week with the sad passing of the seemingly indestructible Tommy Hafey. “T-shirt” Tommy as he was affectionately known was a remarkably successful coach who was renowned for not only creating better sporting teams, but for positively influencing people on and off the field. As a coach, he took an interest in every player on his list, from the superstars to the fresh-faced rookies and found a way to inspire them to reach their full potential as athletes and citizens. He was an amazing leader and one of his greatest legacies is that 18 of his ex-players went on to become senior coaches in their own right. His personal creed was “Desire plus Dedication plus Discipline plus Determination equals your Destination” and he lived this out for his entire life. As a sporting coach, he would tell his players that they couldn’t guarantee that they would be the most talented team, but if they worked hard enough, they could guarantee that they would be the fittest. He led them on scorching runs and vigourous match simulation training sessions that would soon sort the men from the boys. And on every run, Tommy would lead from the front, exhorting his players to keep up. 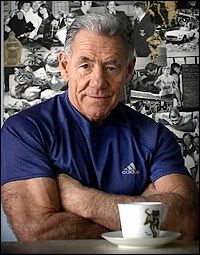 Even well into his early 80’s, Tommy was dedicated to maintaining his personal fitness, with a punishing early morning fitness regime that included an ocean swim, 8 km run, 250 push ups and 700 sit ups every day. For him, retirement wasn’t an option and he always aimed to make the most of every day. He had a fantastic outlook on life, with a contagious optimism that positively impacted everyone who met him. Some will look at Hafey’s coaching record of 4 premierships at my beloved Richmond Football Club and say that he was a terrific coach. Those who knew him best will look at the impact that he had on their life and say that he was a truly inspiring person who left an indelible mark on their lives. It doesn’t matter whether you’re a lion or gazelle; when the sun comes up, you’d better be running. He may have stopped running, but I hope that he has inspired you to maintain the desire, dedication, discipline and determination to keep running towards your destination in life.